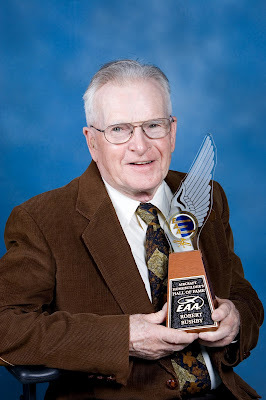 My dad really enjoyed aviation and helping everyone in aviation, both in and outside the Experimental Aircraft Association (EAA). 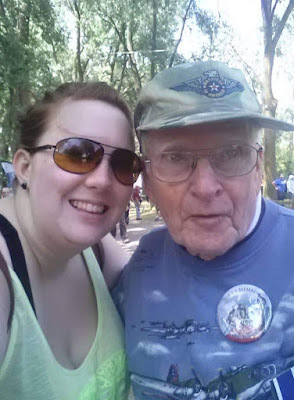 He attended the EAA conventions from day 1 for 64 years in a row, not missing a year. (Most likely the person with the highest attendance record at this time.) This is why I am dedicating this page to him and his aviation. If you have anything that you want to share, please send it to me. The above three photographs were taken during my dad's induction into the EAA Homebuilders Hall Of Fame in 2005. The Midget Mustang (or Long Mustang) was to become a production airplane made by Schweizer Aircraft, until the passing of designer Dave Long. 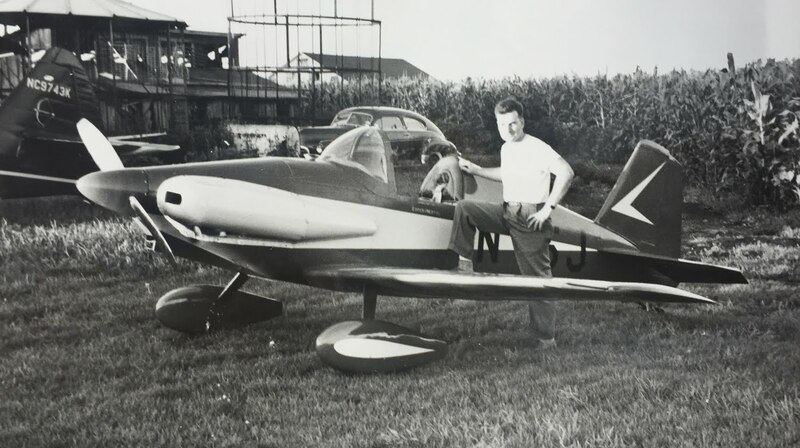 My dad worked at Schweizer building six production prototypes, the first one being the N35J. I do not recall the exact detail how or why the N35J was damaged in Iowa, however after Schweizer dropped the production, my dad ended up with parts from it and rebuilding it. (Mid Atlantic Air Museum [MAAM] who has the N15J updated me that the N35J may had been ground looped. Thank you! Click "here" for MAAM website.) 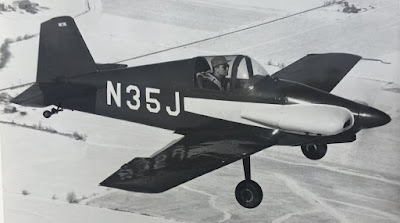 Unfortunately the FAA came along and said he could not re-use the N35J registered number because it was reassigned to a Beechcraft J35 Bonanza in 1958 (being the Midget Mustang did not have a production certificate). My dad then obtained N15J in its place because of the ease to change the N-number. When you compare the N-numbers in the photographs, you can tell how my dad modified the paint job. This next text is from a typed document I believe was intended for advertising the Midget Mustang, circa 1960. 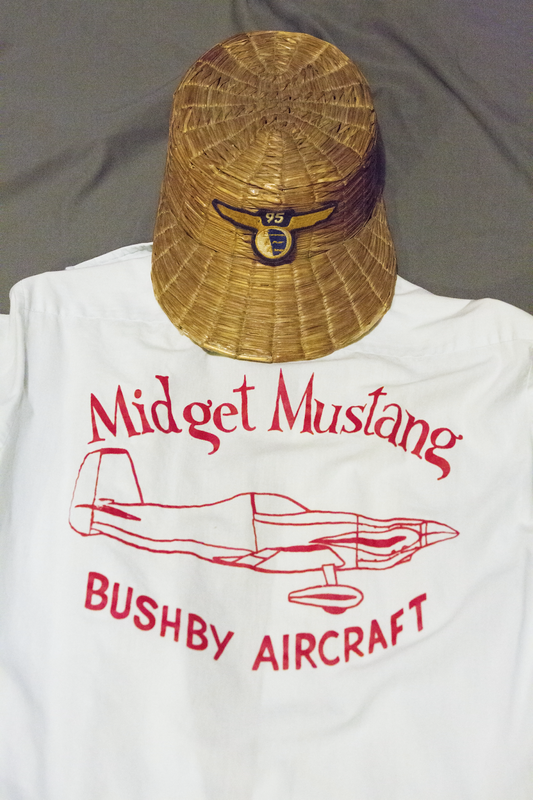 "The Bushby Midget Mustang is a modernized and updated version of the famous Dave Long Midget Mustang. This aircraft was originally designed in 1947 by the late Dave Long, who at that time was chief engineer for Piper Aircraft Co., as a high performance and fully aerobatic sport airplane. In 1951 all drawings, jigs, fixtures, and parts on hand were acquired by Dr. F. Torrey and R. Bushby. Their intentions being to develop a sport aircraft for construction by the amateur aircraft builder. Although the Bushby Midget Mustang is identical in exterior configuration to the latest Long model, it does incorporate construction changes designed for the homebuilder and sport flyer. These changes include standardization of materials to make use of the new alloys that are readily available today; construction simplifications; cockpit and canopy changes for more pilot comfort. The Midget Mustang’s 9G structural strength and low power loading give a true high performance and fully aerobatic sport plane, as well fast cruise speed for cross country flying. The Midget Mustang can be powered from 65 to 150 HP. Level flight speeds to 230 MPH with a rate of climb in excess of 3,500 FPM are possible. The most popular powerplant is the Continental 85 HP model, which can be equipped with fuel injection when an inverted flight fuel system is desired. Because of their low cost the Lycoming 125 HP G.P.U. engine is becoming popular. Flight characteristics are very good. The low center of gravity and wide landing gear results in very ground handling, and visibility over the nose is adequate. Take off run is short and initial climb angle is steep. The different aileron travel used reduces the rudder requirement considerably, very good aileron rolls can be executed simply by raising the nose slightly and applying aileron pressure in the desired direction, with both feet on the floor, completely off the rudder pedals. Stalls are proceeded by ample warning in the form of the tail buffeting and reduced stick pressure. Recovery is rapid upon application of power or relaxing the stick back pressure. Full power on stalls however may alarm the novice pilot. The nose attitude with full power is very high and the stall quick, with engine torque tending to drop a wing. Stalling speed with full flap is 57 MPH, without flap stall speed is 63 MPH. Landing is very similar to that of a Piper Pacer. While on downwind leg at approximately 130 MPH the flaps are lowered to 2nd position. Full flaps are applied at 90, and an approach speed of 80 is maintained until “over the fence”. Flare out is executed at 70, and the plane will touch down nicely at 55 to 60 MPH. The flaps are very effective in eliminating any floating tendency. Being of simplified all metal construction, the Midget Mustang is perhaps the easiest aircraft to construct that is available to the homebuilder today. Due to the great utilization of aluminum by industry today, and the resultant decrease in aluminum costs, the Midget Mustang is also the least expensive aircraft to construct. Stressed skin type construction is employed, utilizing flush riveting throughout. Although the dimpling operation for the flush rivets adds about 25 hours labor to the construction time it is more the justified by the performance gained. The fuselage is of full monocoque type construction employing seven bulkheads. Wings are full cantilever, employing a built up modified “I” beam type main spar, and ten ribs. A modern laminar flow airfoil is used. There are no complicated fittings or parts that the homebuilder would not be able to fabricate. Also, no machine work is required. The construction manual, which is included with the construction drawings, gives a step by step description of the construction process so that the inexperienced aircraft builder will have no great difficulty in its construction. The construction manual is fully illustrated with photos and sketches, and the drawings are very complete." My dad's passion was aviation. It did not matter of what type. 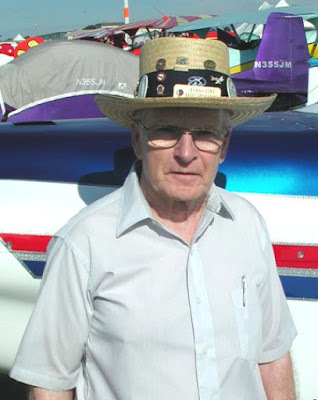 He enjoyed planes used in air races, which is one reason he picked up the "Long Midget" to build and to help others to build. In the 1950's the popularity of building your own plane became a reality for many. The EAA came along to help join the airplane designers with the builders, helping each other in the crusade of home built aviation, and to find a new path of certification from the FAA so the planes could be flown. 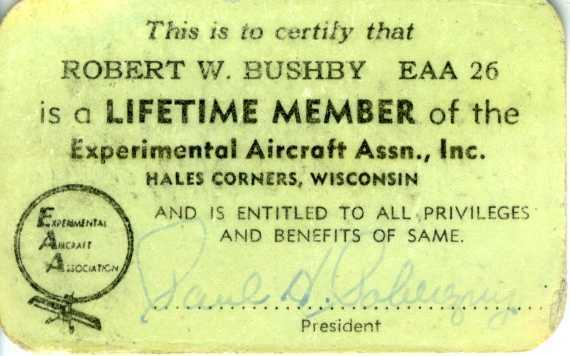 My dad obtained EAA membership #26, though that was because he had not decided the first day to sign up, or he would have had an earlier #19 (needed to borrow the $5 fee). He went back the second day with $5 in hand. The next 4 pages are from the Sport Aviation magazine, dated May 1960. An article written by George Hardie, Jr. can be found starting on page 5. I want to thank the EAA for giving me permission to scan and load this article into my blog. This was the beginning of "Bushby Aircraft" and our selling of the Midget Mustang kits. You can find out more on the EAA by clicking "here". Bushby Aircraft operated out of Minooka, IL, then Dolton, IL, to Glenwood, IL, and back to Minooka. Our private sod 1,900 ft. airstrip was located in Minooka. This is where I have a lot of fond memories of weekends on the farm and other aviation enthusiasts either flying in or driving in to see what was going on, or to ask questions about their airplanes. What was most exciting were the private airshows. Many of the local aerobatic pilots would come by to practice a little or give us a show, like Pete Meyers and Dan McGarry. I would help layout and build kits for builders, tracing out parts from templates, sheering aluminum, and bending spars. Of course a lot of time was hanging out with my cousins getting into trouble. Starting with the April 1966 edition of Sport Aviation magazine, my dad published the first of five articles that would run through the August 1966 publication, on "Building The Midget Mustang". This was in conjunction with completing his Mustang II that was first flown to the 1966 EAA Rockford Fly-In. The years at Rockford, and the beginning years at Oshkosh were probably the best for me. That is when my dad held forums on how to form aluminum ribs and bulkheads. No fancy tools required. He would stand up in front of the audience and explain the technique as he formed. In the display tent we were at, there was a mockup of a Midget Mustang bulkhead and spar that was laminated and riveted by hand. Rib blanks and all the stages to the finished rib were on display as well. Fluting pliers were made by hand using a standard adjustable wrench with brazed copper pipe contoured and polished for the flute. A brass bar with a slit was on display for forming the rib lightening hole flange. (A build from scratch approach, or a roots airplane build if you will.) All of which he had me use while in the tent to show others how easy it was. Later, my uncle made a composite set of fluting pliers that my cousins Harvey, David and I went around selling for my uncle. That, and we sold the back cutoff of the Midget Mustang bubble canopies as windshields for open cockpit planes. I think my cousins and I thought we were entrepreneurs, making sure we got our cut of the money, and we enjoyed spending it on sodas and burgers (squirt guns and balsa planes too). One thing I enjoyed learning was forming the firewall. We would pack the stainless cut blank in dry ice, and after it cooled down, we quickly placed in on the form block and bent the flange with a plastic mallet as far as we could, then used a lead bar to wack the flange over the form block and into the flutes that were in the form block. No spring back for the most part. My dad still had a day job (actually night job). He worked for Sinclair Research in Harvey, Illinios, which later became Atlantic Richfield Company (ARCO). 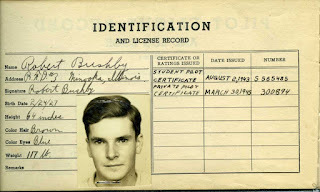 He then went to work at the Westinghouse armature rewinding facility in/near Chicago. 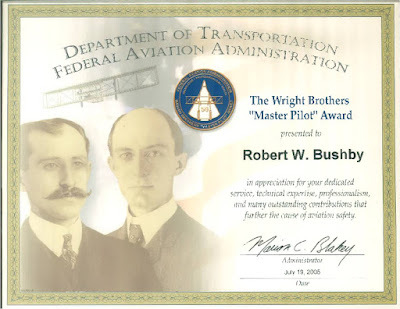 Eventually he quit there and worked Bushby Aircraft full time again. After a lot of Bondo on the Mustang II prototype wings to cover a poor rivet job (riveted by others, not my dad), I learned quickly that a good rivet job saves you a lot of time in the end, let alone saving a lot of weight for not using Bondo. The Mustang's performance is the wing. That is why my dad preached to start on the center section for the Mustang II. Get your practice in on the center section. There are a lot of rivets to practice on. By the time you are ready to start the wings your technique should be developed. A smooth wing is a fast wing, and is a low stall wing. I still wonder the real reason for the Mustang II. Yes, builders were asking for a two seat version of the Midget Mustang performance. It could have been a tandem, but ended up side-by-side. What I thought was funny, even as a kid, was potential builders at the EAA convention would ask my dad to take their wife up, hoping she would be thrilled enough to allow her husband to spend the money, and time, to build the Mustang II. For the most part I believe it worked. In 1971 I started making the fiberglass cowlings, wing tips, wheel pants for the Mustangs. I was getting more involved, and realizing that the Midget Mustang and Mustang II were a world wide popular airplane. Especially in Australia. One Australian builder changed the cowling to remove the "bug eyes" used to direct the air cooling over the cylinder heads, to a annular ring around the spinner. I asked my dad if I could modify his cowling to experiment and he said yes. The next photograph was the outcome. In the end I am not sure there was much gain in cooling. We did a lot of trials on the prototype Mustang II. Builders who had a fear of a conventional aircraft (conventional gear or sometimes refereed to as a taildragger) wanted to know if they could add tricycle gear (training wheel as I called it). My dad said sure, and he went out to show how it could be done. I believe we used the Piper Tri-Pacer nose wheel system. Another trial I remember was hurner wing tips. We flew one side with the standard wing tip, and the other with the hurner tip. We really did not do enough study, though my gut reaction was they seemed to give us a better turning rate of climb, perhaps because of the longer extension to the wing. Shortly after that my dad finally remembered his dream that he kept beating his head about. That was on how to adapt a folding wing to the Mustang II. Many builders wanted to save space, or share space, especially in the winter months. By folding the wing you could either take it home, or park the Mustang II under a high wing in the hanger. I ended up creating the drawings for that after my dad prototyped the parts. One of the proud moments my dad had with EAA was when he was honored with the August Raspet Award. The "Who's Who" of aircraft design as the EAA put it. You can read more about it by clicking "here". My dad won this award twice. I am not sure it was suppose to work out that way but it did. The first time was in 1967. I remember an EAA representative asking him in a stern voice to be at the evenings festivities. So we went. My dad was totally unaware he had been selected. This one recognition wrote his story. Then in 1973 he won again. This time the EAA representative was not as stern in voice asking us to be there. My dad had been asked many times to attend, just to attend. That evening I asked if we could go get pizza in town. My dad had forgotten about the invite to the evening festivities, so he did not have the chance to receive the award in person. I think that would have been the icing on the cake. Thank you to all those present and past who supported him for both awards. My airplane interests started in grade school as an airplane model builder. Usually rubber band powered models. Aviation has always been my hobby, even to this day. My first airplane ride, at age ten, was in a Ford Trimotor. Second ride was in a Stinson SR-5. My family moved to rural Minooka, IL, in 1941. Attending high school in Minooka was very compatible with my desire to fly. As a high school junior I would skip classes in the afternoon, hitch hike 8 miles to the Joliet airport for a flying lesson and arrive home at the time I usually arrived home from school. I earned money for flying lessons working for neighboring farmers at $3.00 per day. Not much by today’s standard, but Cub rental was only $6.00 per hour then. My first solo flight in a J-3 Cub was in 1943. I graduated high school in 1944. 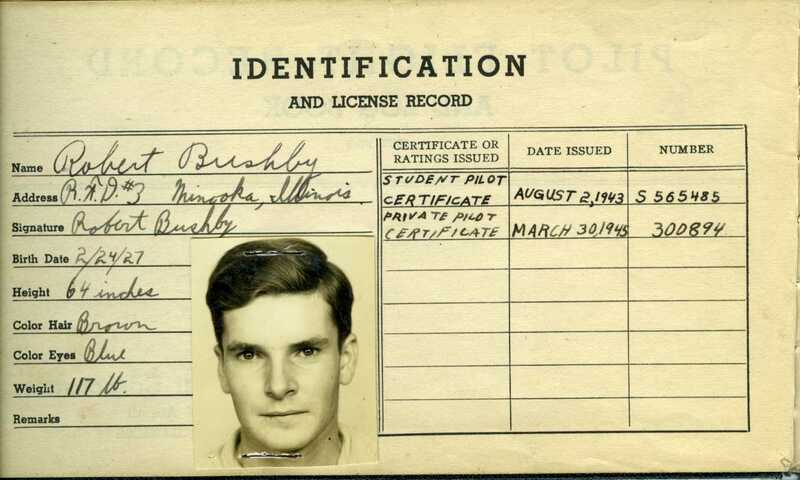 I obtained my private pilot license in 1945. I attended the University of Wisconsin a short time prior to military service, which consisted of aircraft maintenance school at Keeler Field in Biloxi, MS, followed by time on Guam in the 4th Emergency Rescue Squadron as a B-17 flight engineer. 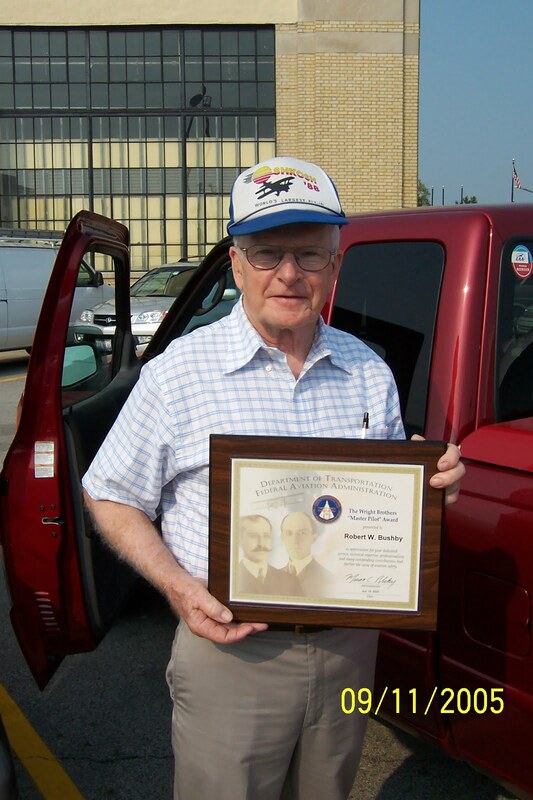 In 1948 I graduated from the Lewis College (Lockport, IL) aircraft maintenance course as an A&E mechanic. I added the IA rating to the certificate when the program became available. I am still active in aircraft maintenance. In 1948 I established the Bushby Restricted Landing Area (RLA) on the family farm. This RLA is still in operation. During the 50’s and 60’s this was a mecca for the local aerobatic flyers. A good weekend would often find three or 4 clip wing Cubs, Pits, and other aerobatic types. 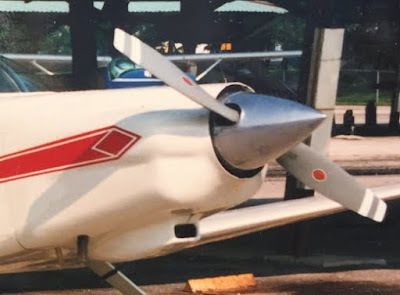 It was of interest to observe the evolution of the Pete Meyers clip wing cub to the highly modified aircraft it is today, that hangs displayed in the EAA Museum. 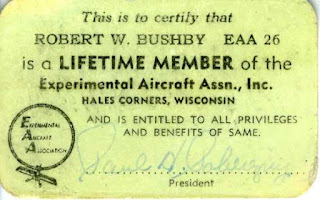 I joined EAA in January of 1953 at the inaugural meeting. I had attended previous meetings at the Curtis Write airport after seeing a notice by Paul Poberezny in the Popular Aviation / Flying magazine. My EAA number is 26, and my technical counselor number is 20. I have attended every EAA national convention from 1953 through 2015. I attended the first Witman Field convention in 1956 flying a Cessna 195 from Joliet, IL. I have had homebuilt aircraft at the EAA national convention continuously from 1960 to 1992, at which time I terminated my Mustang business. My prototype M-II, N117M still attends with the new owner. The FAA pre-cover inspection of the first wing of my prototype Midget Mustang was January 1953. Completion was not until 1959 due to employment changes and time spent in San Antonio, TX where six Midget Mustangs were built. The FAA inspector’s statement after inspecting the wing that I was constructing was discouraging. He asked if I planned to obtain a type certificate for the plane. If not, I would not be permitted to fly it. Fortunately the EAA has been able to change this policy and this is no longer a problem. I closed my aircraft maintenance shop in 1953 for the short session in San Antonio, where six Midge Mustangs were built in 1954 and 1955. My “prototype” Midget Mustang has a unique history. It was the first of six to be built in San Antonio as N35J. It was severely damaged in a 1956 accident in Iowa. I used the parts from N35J to complete my Midget Mustang, and as registration would have been the same I used that number on my plane. The FAA had cancelled that registration so I had to change it to N15J. Pictures of N35J and N15J are of the same airplane. After returning from San Antonio in 1955, and knowing that full time employment was needed to support my aviation hobby, I went to work for Sinclair Oil Company in the Engine Research Laboratory, continuing the Mustang business as a part time venture. Following three years of design and construction, the first flight of my two place Mustang II was July 1966. I picked registration number N1117M as it was easy to paint. To get familiar with the Mustang II control response as I had been flying an Ercoupe the previous three years, I may have carried the “high speed taxi” to extreme. My grass airstrip is 1900 ft. long. The procedure used was to take-off, maintaining 3 feet for a few hundred feet, then land. Then repeat the process going back the other way. The canopy and cowling were not installed at this time, creating lots of drag and preventing me from floating into the neighbor’s corn field. Three weeks later in July of 1966 at the EAA Rockford national convention I received the third place award for outstanding design. The Mustang work was becoming too much for a part time venture so I left Sinclair in 1970. I operated the Mustang business full time until September of 1992, at which time Mustang Aeronautics took over. I conducted Metal Aircraft building forums at Rockford and Oshkosh for 25 years. I developed tools (hole flanger and fluting plier) and techniques for working with 2024-T3 “hard” aluminum. I demonstrated these techniques at the forums. These tools and processes made it possible for the homebuilder to fabricate metal aircraft without the need for heat treatment or special equipment. With the advent of today’s quick build kits these techniques are seldom used. I was an early member of EAA Chapter 15, meeting at St. Rita high school when the prototype EAA Biplane was constructed. Chapter 15 now meets at their building on Lewis Lockport Airport. 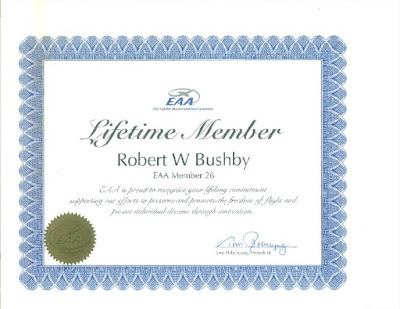 In 1956 I was instrumental in forming EAA Chapter 95, now located at Morris, IL airport. From 1974-77 Chapter 95 hosted the AC Flight Rally. This was a three stop efficiency race from Flint, MI to the EAA Rockford national convention. I contributed to the formation of EAA Chapter 260 and I am a lifetime member of that chapter. Chapter 260 is based at Lansing, IL. I am still an active member of all three chapters. Prior to EAA I operated an aircraft maintenance shop at Ottawa, IL, from 1948 to 1953, specializing in fabric aircraft. Aircraft fabric then was cotton and linen. Ceconite had not been invented yet. Restorations completed there were a “totaled” Piper J-5 in 1949, a Waco AGC-8 in 1952, and after closing that shop and working in my hanger at home I restored a Myers OTW in 1958, along with a Taylorcraft L-2 in 1954. Since retirement in 1992 my hobby is visiting airports (having visited more than 200 airports). I enjoy traveling throughout the Southern states by means of a Motor Home. I have an 18 x 24” poster in the rear window showing Homebuilt Aircraft. This poster was given to me in early 1960 by then EAA director, the late Marty Headtler. This poster has lots of miles on it and gets attention at airports and on the road. In areas where there are a lot of airports I may travel less than 200 miles per day. When not traveling, or hanging out at the local airport, I have a partially completed Mustang II in the hanger that keeps me busy. MUSTANG builders have had 6 Oshkosh Grand Champions, more than any other design. Lots to still write. 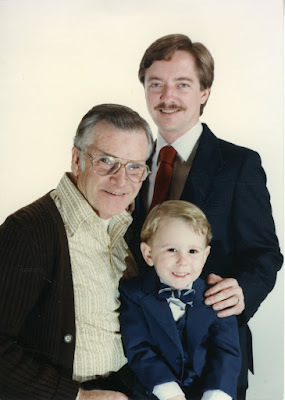 In the mean time you can find out more about my dad on Wikipedia of all things. Feel free to donate photographs and stories that you may have to: WesBushby[at]gmail.com. Dad working at engine test lab, Sinclair Research. Dad wanted me to wear his famous straw hat and to take a picture of me near this plane. The J3 Cub to the right in the above photographs I believe is the Cub I solo'd in. Dad in Dan McGarry's P-51 3/4 scale mustang. My cousin's daughter Emily with my dad. The above video is from a Paul Moses feature story for AOPA, the "First 100 Members" of EAA. My dad served in WWII in 1946 and 47, in service to the people of the Unites States of America, honorably discharged at the rank of Corporal. His military occupational specialty was an Airplane & Engine Mechanic 747. He flew as the flight engineer on B17s modified to drop motorboats. He was decorated with the Victory Medal and the Army Occupation Medal. My dad never talked about his military service with me, by choice. What I can say is that he always felt an attachment to our WWII veterans and made it known to them as he would pass by individuals showing the insignia from that time. On November 30th, 2018, my dad was given a military honors memorial service at the Abraham Lincoln National Cemetery located in Elwood, IL, and later laid to rest. I have to say it was very honorable service, for both my dad, family, and friends. My cousin Harvey arranged a flyby with a couple other local pilots who knew my dad, and timed their pass perfectly. Many, including myself, were choked up when it happened. I will always see my cousin's Champ in my horizon now, continuing the memory of my dad. Thank you, Harvey. Proud documentation of a great man. Some years back I spent an enjoyable hour or so at Oshkosh with your dad discussing the Midget Mustang and homebuilding. He was one of the true pioneers of homebuilding and his dedication to the art will be missed. Great post Wes. Sorry for your loss. Happy you are able to post your fathers provenance.